Well, this has to be the question of the century that Android or iPhone, which is better and why? 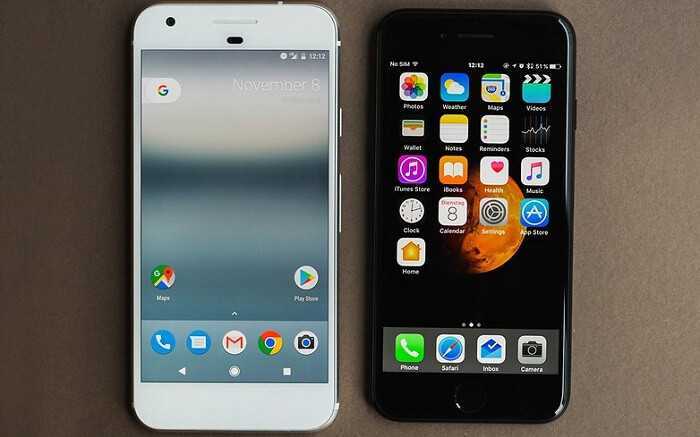 The mystery keeps buzzing in the mind of every mobile phone user since these two smartphone companies became giants in the mobile world. iPhone and Android, both offer many cool and great features and which one is best to buy, the first choice can be the hardest. To make it easier for you, we are going to do a comparison test between the two, through which you can easily comprehend that which smartphone is ‘smarter’ and best for you. But before outlining the comparison, we want to clear that this article just for informational purpose and not meant to be a decisive comparison test between iPhone and Android. So without further ado, let’s go through the details. The very first thing to count for is ‘Hardware’. It is to keep in mind that only Apple makes iPhone while on the other hand many makers like Samsung, HTC, Sony etc. are using Google’s Android software on their smartphones. Apple has extremely tight control over iPhone’s hardware and software and Android mobile phones vary in features and quality. Choosing iPhone model is relatively easier than Android because of Apple launch 3 or 4 models at any one time. So if you are buying iPhone then you only have to choose model while many mobile phone makers use Android OS so you have to choose to make and model as well if you are going to buy an android phone. Both platforms have app stores. Android leading the number of apps in their play store while apple app store offers fewer apps but here higher number is not a winning point because many of us use a handful of apps and most common apps are already available on both platforms. Google play store is a bit easy to use and offers more free apps as compare to Apple app store. Apple has a strict policy for app developers while submitting apps to the app store so developers progressively targeting Android as their first choice. Camera function is one of the main functions that catches user’s attention most. Both iPhone and Android have high-end rear front and back cameras and this a difficult question to answer that which has a better camera. Most budget android phones don’t even come close to the quality of iPhone cameras. But latest android phones from companies like Samsung surely put a tough competition to iPhone as far as camera quality is concerned and managing camera photos is much easier in android as compare to iPhone. iPhone is definitely leading in Security and Privacy section. As per the reports, Android phones are more vulnerable to malware and hacks. Speedy and timely updates in the operating systems of mobile phones are now more important than ever before and Android is behind in this matter. Apple is proactively working for security and privacy of general consumers most notably in Face ID and Touch ID functions also it encrypts data in iMessages and other apps. So as a consumer you feel safe while using iPhone. On the other hand, Google mines user data and information for better ad experience. So if you are looking for security and privacy of your data and information then iPhone is the best choice for you. Android phones dominate the market as per the number of users and hold a major share in refurbished mobile phone sales. But it is also to keep in mind that while reselling old iPhones bring more money than old android phones. There are plenty of websites that offer mobile phone recycling service so that you don’t have to leave your couch and recycle your mobile phone by just sitting at home. Many users think that using iPhone is not that handy as compare to android because of the features and built-in functions that android offers. It provides complete control over customization of the phone. Apple, on the other hand, provides limited customization and you cannot change default apps on your iPhone. If you want a phone that has high-quality user experience and easy to use then android is the winner here. One of the biggest worries of smartphone users is Battery life of their mobile phone. It is difficult to compare these two as far as battery life quality is concerned. Both Android and iPhone allow you to view your mobile phone’s battery usage but the only android lets you see and get an estimate of how much battery life is left. Both IOS and Android offer power saving option to hamper apps to consume your mobile phone’s battery life. In past, Android phones had an advantage over iPhones because of fast charging capabilities and wireless charging but iPhone’s latest editions like iPhone 8, iPhone 8 Plus and iPhone X are offering fast and wireless charging. Although people do cheap iPhone sales there is no ‘Cheap’ iPhone from its makers. Brand new iPhone costs you a lot of pounds. So if you are concerned about cost then android is the best option for you because android comes at cheap and high prices. Although IOS and Android both have highest priced phones as well average cost of Android is lower than IOS. Here in ‘updates’ area, iPhone beats Android hollow because of its timely updates and that too for every iPhone user. In a study, almost 90% of iPhones have the latest OS version while on the other hand, only 0.5 % of Android devices have the latest Android OS version. So the choice is yours. This is an era of Artificial Intelligence or simply AI. Androids have Google Assistant while iPhones have Siri as their AI modules. Both Siri and Google Assistant have almost same capabilities. Android is still unbeatable in cloud services. Apple is still lagging in this department. Android offers better cloud storage and automatic updates. Google’s cloud storage is easy to use and more effective than Apple’s cloud service iCloud. Android phones have the biggest screens to date. Samsung Galaxy Note 8 has a bigger screen than latest iPhone X. So in screen size, Android is the winner. As discussed above, this article is not meant to select a winner amongst iPhone or Android but to only share a comparison between the two which will help you if you are going to purchase a new smartphone for yourself. Both platforms offer great choices for different people but in the end, it’s entirely up to you to choose which platform suits you the best.